Iona is well known for the history of its abbey, founded by Saint Columba in the 6th century, a very important event in the conversion of Scotland to Christianity. The present day abbey buildings are the rebuilt 13th century abbey. 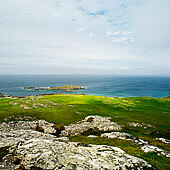 A little bit to the North is Dun I, about 300 feet high, with lovely views over Iona, Mull and the Treshnish Isles. The day we were there was a largely grey day. Only when on top of Dun I there was some breaking of clouds.